"Salades et Vinaigrettes", the theme for this week at I Heart Cooking Clubs (IHCC). 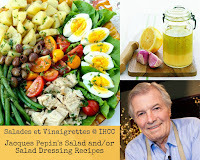 It's salad/or salad dressing week with Jacques Pepin, our current featured chef. I've made JP's simple yet so good Garlicky Romaine with Croutons. A video of JP making this salad can be found at Rachel Ray show's website, here. It is a simple salad and takes only minutes to prepare. Recipe uses stale sourdough bread, but I have used regular white bread instead. I bought a pack of baby romaine, and the rest of the ingredients are pantry ingredients ; whole-grain mustard, garlic, salt, pepper, red wine vinegar, and I have used extra-virgin olive oil. In the video, JP has used peanut oil. Bread is cut to cubes and then toast with a little olive oil in the pan for a few minutes until brown all over. The salad dressing is mixed together and toss with the salad leaves just before serving, top with the toasted bread cubes. This is a simple and very tasty salad. I like the garlicky mustard dressing! And I have always love breads in salads. I've made this salad twice already and will definitely be making it again. Heat the oil in a large skillet, when it is hot, add the bread and saute for about 4 minutes, until nicely browned on all sides. Remove from the skillet and set aside. Combine the garlic, salt, pepper, mustard, vinegar and oil in a bowl suitable for serving the salad. When ready to serve, add the lettuce to the bowl and toss with the dressing. Sprinkle with the croutons and serve immediately. Preparing a healthy Green Salad "Garlicky Romaine with Croutons" is always a good concept for stay yourself and your family healthy. I used to include it in my every meal. Simple, fresh and very tasty! I've always liked JP and his great recipes! Your salad looks delicious, thanks for sharing! OH! Yes, please. Simple but delicious! oh yumm!! would love a bowl of that, those lettuce leaves look so nice and fresh, are they from your garden? Pepin has a way of packing flavor with simplicity. Your dish looks luscious! Joyce, what a tasty salad! Simple and yet wonderful with the crunch of the croutons. Yum...homemade croutons are always the best! This looks like beautiful everyday kind of salad that you can always count on.